because UV exposure is the number one reason for accelerated ageing. I’ve long been careful to apply a sunscreen to my face on a daily basis, but increasingly I’m aware of the importance of applying it to the rest of my body too – especially on an unexpected warm Autumn weekend or during a lengthy stint in the open air. But where can you turn for help that’s suitable for the whole family, 365 days of the year? Although I dabble in various different formulas and brands for the purpose of this very here blog, Ultrasun is the one brand I seem to turn back to time and time again. Their lightweight and easily absorbed formulas are a pleasure to apply, while the lack of irritants means I can even apply them to my partner’s eczema-prone skin with ease. 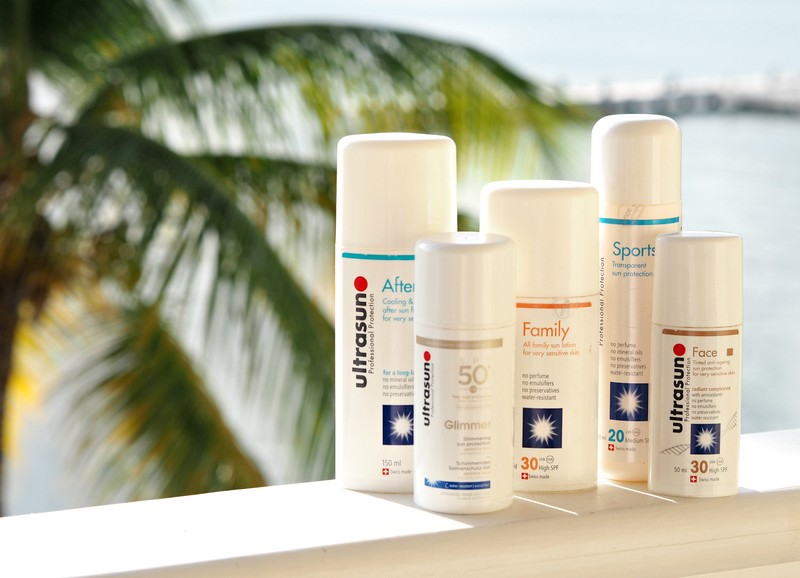 Breaking it down, here are the main reasons you’ll want to get on-board with Ultrasun – no matter the time of year. Most suncare brands offer up a cocktail of perfume, emulsifiers and preservatives within their formulas that can increase the risk of sun allergies (i.e. prickly heat, which is caused by blocked pores) and irritate sensitive skin. Ultrasun doesn’t use perfume (except within the After Sun and Daily UV Hair Protector), emulsifiers or preservatives thanks to their ‘airless’ packaging; this means the formula remains stable without these added nasties that can play havoc with sensitive, irritated or eczema prone skin. The creamy and gel-like textures glide over skin and are easily massaged into the surface, leaving behind no white marks or greasy residue; the finish is dry to the touch, while still giving skin a comfortable boost of moisture and protection. Unlike many other sun protection products, Ultrasun doesn’t leave you feeling sticky or covered in sand. Who has the budget, time, space or inclination to pack up four different lotions and potions for every member of the family? What I love most about Ultrasun is that their formulas are suitable for everyone – including super sensitive skin types, children, eczema sufferers and those prone to prickly heat. I don’t have to worry about taking away suncare for me and separate products for my partner, because Ultrasun doesn’t irritate or sting his eczema; as someone that suffers from heat rash and incessant insect bites, I can be safe in the knowledge that Ultrasun won’t cause further irritation too. Whether you like the traditional feel of a cream, the lightweight and instantly absorbed texture of a gel, or want to add a subtle sheen to skin simultaneously, Ultrasun has you covered. The ‘sport’ varieties are perfect for all year round (as they’re instantly absorbed and leave no detectable residue,) while the Glimmer version offers a very subtle healthy glow to skin that’s perfect for summer. It’s like picking which foundation to wear every day, but in SPF form. (after first being opened.) This means you can keep going back to the bottle if you don’t get through it during your holiday, remaining protected throughout the year or even saving it for your next getaway. Although the prices of Ultrasun are a little more than your usual Nivea or Soltan, they’re built to last and offer hardworking protection every time. I personally find them comfortable to wear, easy to take to the beach, a pleasure to apply and a brand I know provides peace of mind when it comes to remaining protected. There’s no doubt in my mind as to which brand I would recommend every time. Photo taken at St James’ Club, Antigua. For more info on holidays, check out their website or discover the other Elite Island resorts. Flights and holidays served by Virgin, from around £1200pp.